Ever felt butterflies in your belly? Have you received news that felt like a sock in the gut? Your third chakra stores your sense of self. It’s about your intuition and your identity. It’s about how you see yourself in the world. Your self-esteem and willpower live here. This chakra stores the code that says: This is who I am. This is who I want to be. This is how I want to be seen. It’s a yang chakra, connected to your masculine essence which is about igniting power and will and making the magic happen in life. The world around you really affects the third chakra. It acts like a large receiver that takes in the world and assimilates the data. Social codes are assimilated. Parental codes are stored here (think about the umbilical cord! It plugs right into this chakra). About the symbol for this chakra: Mystics saw it as a flower having ten petals. Its yellow color corresponds to the energy of fire. This chakra is symbolized by a triangle. The point comes down to a powerful center- the naval. 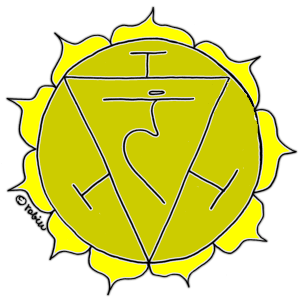 The symbol at the center represents the Sanskrit word for this chakra: Manipura. What kind of thought and feeling “stuff” is the third chakra affected by? Decision making: Are you able to make decisions easily? Do you have a hard time making decisions? Do you second-guess yourself? Confidence: Do you feel confident in what you are doing? Or is there some self-doubt and fear? An undercharged chakra leaves us feeling weak, unsure, unable to manage on our own in life. An overcharged chakra leads to arrogance, power obsession, and a need to control. Emotional Support: Are you able to give yourself the support you really need? Do you feel centered? Do you have a good sense of who you are? Or, do you feel emotionally needy? Worry: Do you spend a lot of time worrying? Do the opinions of other people seem to rule you? How are you at setting boundaries? Do you feel the need of approval from others? Does it matter a lot if people like you, and are happy with what you’re doing? Do you seek recognition? Self-Care: Do you have a good balance between work and play? Or, Does it take an illness to allow you some downtime? Are you good about allowing yourself to sleep enough? Are you kind to your body with proper nourishment? Are you exercising regularly? When your Manipura chakra is out of balance or closed you might find that it is hard to feel confident. You feel needy, worried, concerned about the opinion of others. You may have a hard time making decisions and find that you go over and over and over things in your mind but nothing really gets done! The most important thing I can tell you is: learn to recognize the part of you that wants to please other people so that you can feel at ease inside yourself. Start noticing the way you give in to the fear and worry. Get moving. Take a walk. Move your legs. Especially when you feel upset, worried, or just tired. Try pilates and yoga to strengthen your core. Yoga Poses that support this center: Pike, bow, cobra. Play a game. Think of something you might enjoy that would feel challenging and leave you feeling a sense of accomplishment. I enjoy Sudoku and word search puzzles. Playing solitaire and mahjong is fun too. Pay attention. Give yourself plenty of positive affirmation and validation. Give it to yourself, and practice receiving compliments from others. Breathing. I’ve mentioned before that you do not have to practice fancy breathwork! Just breathe in and out and give yourself some space to make contact with yourself. Foods that are 3rd chakra pleasing: Spices that ignite the inner fire- try ginger, clove, black pepper, cardamom (Chai tea, anyone?). Carbs are nice too- try oatmeal, brown rice, and yummy sprouted grain bread. Please notice your eating patterns. Overeating is a sign you are needing some attention. Same with not eating enough. Pay attention! Love yourself a little more. What gemstones work well with this chakra? Citrine, blue sapphire, ruby, topaz, aventurine, amber, tiger’s eye. Essential oils are the life force of a plant. Oils that work well for this chakra are Geranium, Peppermint, Fennel, Lavender and Chamomile. Try rubbing a few drops right into your solar plexus, or on your mid-back area. What healing exercises can you do to help stabilize this chakra? When you are feeling low confidence, fear, or emotionally needy, stand up and take a deep breath. Notice the way your energy behaves as you believe these thoughts. Notice the way your shoulders slump and your chest caves. Pay attention to what’s happening in your belly. Now, take a deep breath and let that go. Straighten your spine and lift your shoulders. Recall a time when you succeeded. Remember a good outcome. Notice the way even this memory can call fresh and vibrant energy into the body. I’ve written an overview of the seven major chakras here, you might like to check it out for more helpful tips. Thanks so much my friend I hope this supports you and unknown and amazing ways. Remember: You’re amazing and your life is precious! ⟵Is Healing Work Really About Curing the Crazy?